When Darkness Fell, HE Arrived. 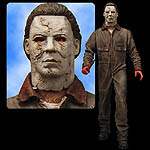 NECA and Rob Zombie have teamed together to bring you the new, modern, updated version of Michael Myers. 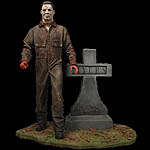 Michael Myers stands over 18-inches tall and is incredibly detailed to match his new film look. The figure includes 2 knives and a motion-activated sensor that triggers playing the Halloween theme song. Order this from Entertainment Earth. 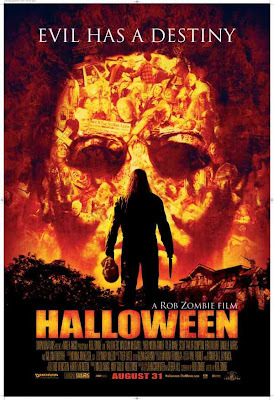 From NECA ... Michael Myers as conjured by Rob Zombie in the remake of Halloween. Michael stands 7 1/2-inches tall and is incredibly detailed. He includes 2 knives, an interchangeable head, and a scary graveyard base. Congratulations to NECA for finally producing a Saw puppet that we all can afford. 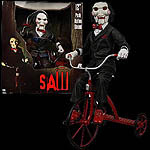 Their version of Billy, the insensitive puppet, is 12 inches tall, fully articulated, comes with his red tricycle and acutally speaks phrases from the movie. "So are you going to watch yourself die today? Or do something about it?" "There are ways to win this." "Live or die, make your choice." "Congratulations, you are still alive." You can pre-order this figure now at Entertainment Earth for an estimated arrival date of January 2008 [subject to change]. This collectible from NECA is moderately priced at $34.99. I'm grabbing one NOW before they're gone!